The Poland is an old breed, although its ancestry is unclear due to many countries having laid claim to its making. Some books connect the type with the Paduan (Patavinian) fowl. 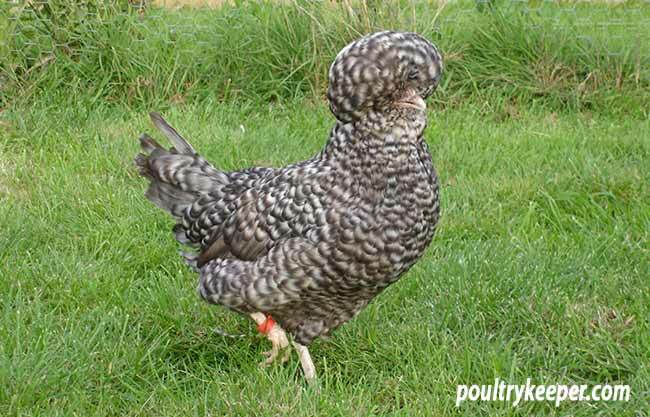 What is clear is that this was originally a utility breed for both table and egg, with the bantam (or miniature) varieties coming along in the late 1800s due to several matings with different breeds to reduce size. A shame really as the bantam varieties that we see are probably more genetically mixed up than their large counterparts. First shown in London in 1845, the Poland was one of the first breeds to be standardised in 1865. Did they originate in Poland? Possibly, but their name is more likely to be a result of the ‘poll’ or ‘poland’ sat on top of their head (the knob and crest), which them makes them Polands rather than Polish…… snobbery on my part perhaps, but perhaps a more fitting reason than simply a country that they at one time may have proliferated in. In some parts of the world, Polands are referred to as ‘Dutch’ which does little to help with the naming of this magnificent breed. Recognised instantly by its massive crest, the exhibition Poland is truly a sight to behold. Sprightly and erect, birds have a fairly long body, similar to a long ‘u’ with a full neat tail carried somewhat low. 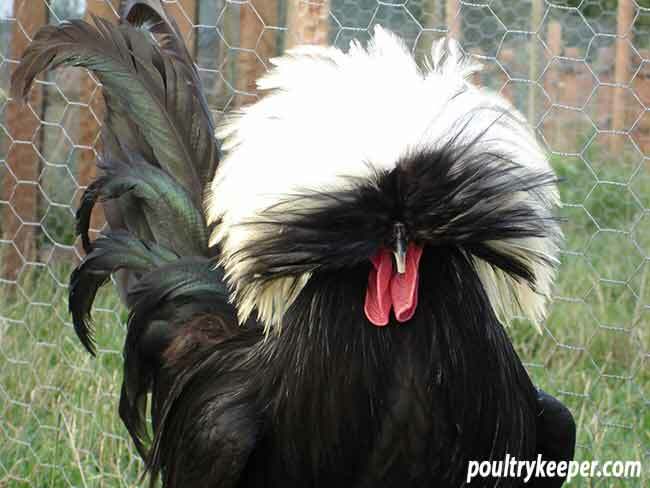 A male White Crested Black Poland. The crest perches on a bony skull protuberance referred to as the knob: in the female the crest feathers form a neat globular ball, while the male feathers fall like a shawl around his head. The distinctive horny nostrils are wide and cavernous. The white crested black is without muffling and the wattles are somewhat bigger, as opposed to the other colours which do possess muffs and usually have diminutive wattles. This breed is a fairly high maintenance bird with a number of conditions being made worse by its crest such as lice infestations and eye problems (See Diseases Common to Polands for further information), although there is movement within the breed club both at home and abroad to reduce the crest to a more practical size and shape. 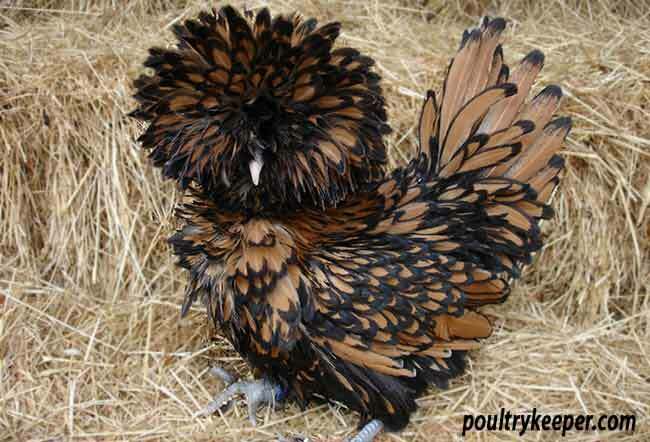 A Gold Laced Frizzle Poland. 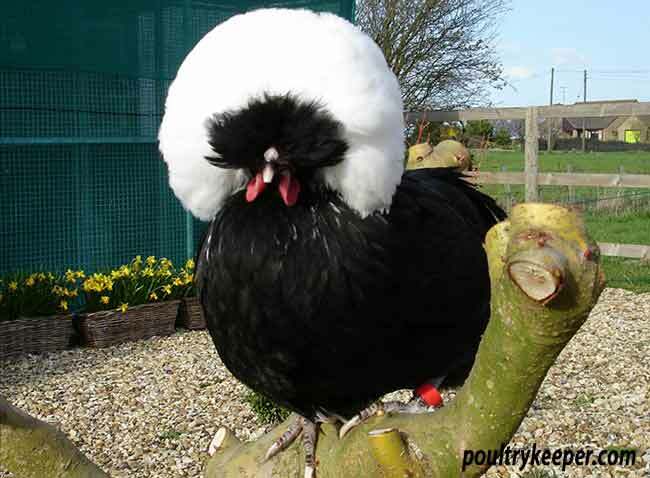 Bantam Polands do make good pets and will, like Pekins, run to their handler for food. Ensure that drinkers and feeders do not allow the birds to soil their crests, which can be taped up or cropped if the birds are to be kept outside to free-range. Standard colours include chamois (buff laced), gold, silver, self white, self black, self blue, white created black, white crested cuckoo and white crested blue. In birds with larger crests the head is very delicate due to the large cranial cavity (seen externally as the knob on top of the head), and if alarmed, particularly if approached from above, the bird will fly upwards and knock itself out. Contrary to popular belief, this is a hardy breed and can be kept outside as long as you provide shelter from the rain and cold, as the thin skull is susceptible to chilling and pneumonia can result. The black colour should be a beetle green, not purple. If your birds are showing too much purple then try crossing your least purple female with a male showing some degree of red in the breast, wing bars or hackles – the red will decrease the amount of black and help improve the green sheen. In general try to cross a dull black female with your male to prevent too much red reduction. A bird with white feather quills on the body should be rejected from the breeding pens. 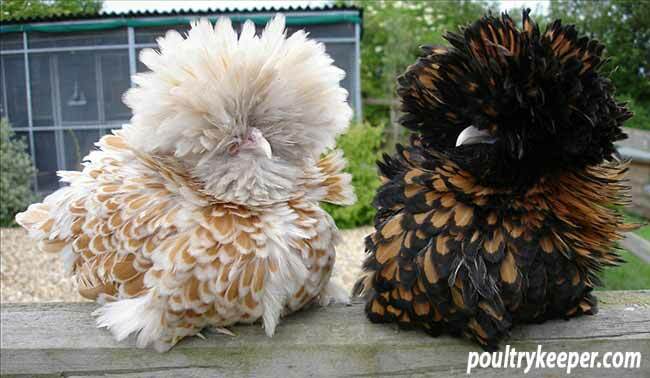 If breeding frizzle birds, do not mate frizzle to frizzle as this narrows the feather. Better to mate plain to frizzle to preserve the width of feather. Blue x Blue – 25% black, 25% splash, 50% blue. Used to produce good blue birds, colour may become patchy in successive generations. Black x Blue – 50% black, 50% blue. Used to produce good blue birds, plus males from this mating will reduce patches from blue/blue matings. Black x Splash – 100% blue. Birds may vary in bae colour, and the blues produced are often inferior. White Crested Black female showing the ‘butterfly’ at the front of the crest. Unfortunately not a sitting breed, artificial incubation is the best method if you want to hatch replacements. Like Silkies, hatchability is poor with some exhibition strains, so a cabinet incubator is your best option. Eggs should be collected a couple of times a day to prevent egg eating (for some reason Polands do like to peck an egg) and stored in a cool room. Incubation is no different to any other breed; it is the hatching which may take a little extra vigilance. Many of the exhibition lines have a thickened membrane in the shell which, combined with humidity problems and the enlarged head dome can make hatching difficult. If after pipping no progress has been made within a few hours, you may want to intervene and help the chick out depending on your ethos. I have in the past helped out frizzles but left white crested blacks – possibly the combination of genetics makes the frizzles less likely to hatch. Only your preference and experience of the line can guide you here on what is best for you. Another of the great exhibition breeds and certainly one of the most rewarding, a good Poland will always make it to championship row of the larger shows. Preparation is time consuming and fraught with problems, but is so worth the effort when the bird is presented well. You can see more photos on the Poland breed page.